Rabbits make excellent pets as they have great personalities and enjoy companionship. In this article, we will take a look at the basics of looking after a pet Rabbit. A suitable home is essential for your pet Rabbit. Even if you wish to have an indoor bunny, you will need an area for your Rabbit to sleep, feed and toilet which can be achieved by using a small hutch or cage. Type – The RSPCA recommends that a hutch have two connecting compartments. “One compartment is for daytime with a wire mesh door to admit light and air, and the other is to provide shelter from wind, rain, or cold”. Size – Your Rabbit Hutch should be big enough so that your bunny can lay down and stretch out comfortably with room left over for you to place the food, water and litter box. Exercise – The RSPCA recommends you provide opportunities for running, jumping, and digging on a daily basis. As rabbits need space to move around and exercise in a safe, grassy area, consider using a playpen for supervised playtime. You may wish to extend your bunnies’ living quarters by attaching a Rabbit Run to their hutch. A good rabbit run will protect your pets from predators and prevent their escape attempts- so choose one that your bunny cannot burrow or jump out of. Placement – Consider where you will place your Rabbit hutch carefully, Rabbits are social animals and require companionship of other bunnies or humans, ideally their enclosure should be placed in a spot where they will frequently have visitors. 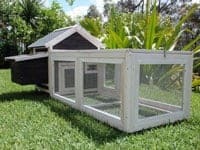 Outdoor Hutch placement – Choose a spot that is sheltered from harsh winds and the midday sun, however if possible, it should get the morning sun. In the hutch– The day compartment of the hutch should be fitted with a water bottle, some wooden chew toys, and a feeding bowl. You should line the floor of your hutch with thick bedding straw. Rabbits also love to hide, so consider adding a log or cardboard box to their play area. Litter box – Rabbits will naturally dedicate one corner of their hutch to be a toileting spot. To contain their mess, line a small litter box with newspaper, shredded paper or non toxic cat litter, then place it in the rabbit’s preferred corner. You may wish to place an additional litter box in their play area as well. When you first get your Rabbit, give it some time to get used to it’s home. It is important to wait until your rabbit/s are settled before you approach them to introduce yourself. Once your rabbit is settled in, talk to them gently before approaching, then approach them slowly and calmly. Rabbits are herbivores (plant eaters). They must be provided with a constant supply of grass and/or hay to maintain their good health. 80% of their feed should be made up of quality fresh grass and grass hay. The remainder should include well washed fresh leafy greens and vegetables. You may also wish to provide certain fruits as occasional treats. Commercial rabbit pellets should only be used in small amounts. Always have fresh clean water available for your rabbit to drink. A water bottle that attaches to the cage is ideal. In hot weather, you may wish to add frozen water bottles to help keep them cool. Certain foods are bad for rabbits. You should avoid giving your bunnies: rhubarb, seeds, corn, peas, potatoes, iceberg lettuce, tomatoes, cabbage, beans, beets, onions, grains and meat. Certain plants are toxic to Rabbits, please check with your vet or pet expert before offering a new food. A comprehensive list of plants which are toxic to rabbits can be found at the Victorian government website, by clicking here: toxic foods and plants for rabbits. Rabbits naturally love to chew. Provide them with plenty of safe opportunities to do so- most pet stores stock wooden chew blocks made especially for this purpose. It is recommended that you replace bedding straw daily and thoroughly clean your Rabbits hutch weekly to keep them healthy. All rabbits need regular health checks and should have vaccinations from calicivirus. Your local vet can help look after your bunnies by providing regular worming, flea control, toenail cutting and teeth checks. The amount of grooming required depends on the breed of rabbit you have. Long-haired rabbits require daily grooming to keep their coat in good shape. This entry was posted in Cats and tagged care, guide, new, pet, rabbit.